A new PwC sponsored report – Global Construction 2030, forecasts that the volume of construction output will grow by 85% to $15.5 trillion worldwide by 2030. It also predicts the average construction growth rate to be 3.9 percent per annum to 2030. Going by the trends, there are umpteen opportunities for marketers who cater to the construction industry worldwide. To help them with a strong data repository, Blue Mail Media provides one of the most authentic, accurate and reliable List of Construction Industry Executives/decision makers. 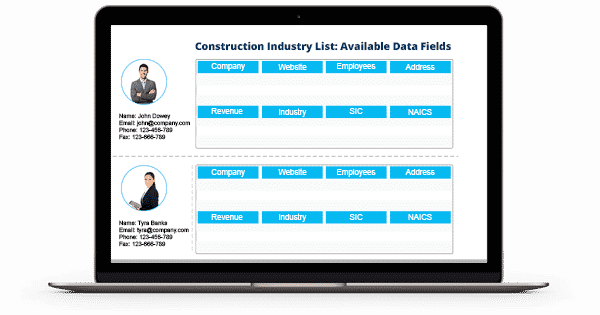 Our Construction Industry Mailing Database has been designed to help you execute your multi-channel marketing strategies in a cohesive manner. Blue Mail Media’s database is sure to help you unlock seamless interactions with the target market and improve your conversion rate as well as ROI. Our strong data partners network enables us to serve you beyond geographical constraints and to offer you pre-packaged as well as customized Construction Industry Email Database. Blue Mail Media employs significant time and resources in order to collect qualitative data, verify data, and constantly update the same to maintain its accuracy and reliability. Furthermore, our strong presence across USA, UK, Canada, Europe, Asia, North America, Australia and other regions helps us engage with clients in a ‘glocalized’ way. We have earned the trust of our clients by providing them with data that never fails to bring the desired results.